In the year 1845, Gustav Kirchhoff (German physicist) introduces a set of laws which deal with current and voltage in the electrical circuits. The Kirchhoff’s Laws are generally named as KCL (Kirchhoffs Current Law) and KVL (Kirchhoffs Voltage Law). The KVL states that the algebraic sum of the voltage at node in a closed circuit is equal to zero. 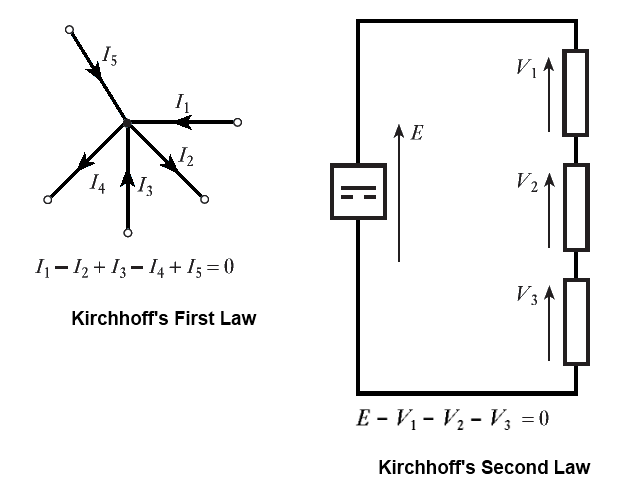 The KCL law states that, in a closed circuit, the entering current at node is equal to the current leaving at the node. 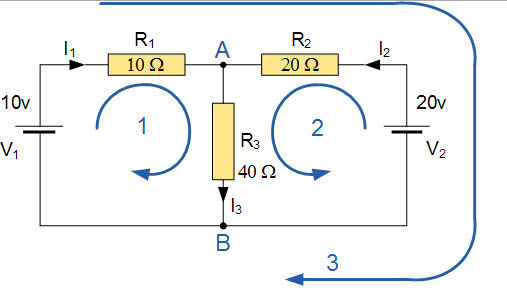 When we observe in the tutorial of resistors that a single equivalent resistance, (RT) can be found when multiple resistors are connected in series or parallel, these circuits obey Ohm’s law. But, in complex electrical circuits, we cannot use this law to calculate the voltage and current. For these kinds of calculations, we can use KVL and KCL. Kirchhoff’s laws mainly deal with voltage and current in the electrical circuits. 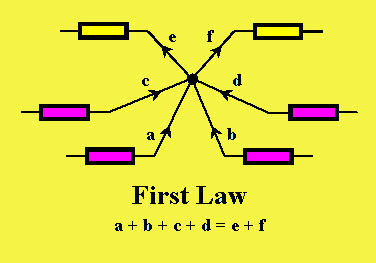 These laws can be understood as results of the Maxwell equations in the low frequency limit. They are perfect for DC and AC circuits at frequencies where the electromagnetic radiation wavelengths are very large when we compare with other circuits. There are various relationships among voltages and currents of an electrical circuit. These relationships are determined by Kirchhoffs laws such as KVL and KCL. These laws are used to determine the impedance of the complex network or equivalent electrical resistance and the currents flowing in the several branches of the n/w. KCL or Kirchhoffs current law or Kirchhoffs first law states that the total current in a closed circuit, the entering current at node is equal to the current leaving at the node or the algebraic sum of current at node in an electronic circuit is equal to zero. Generally in an electrical circuit, the term node refers to a junction or connection of multiple components or elements or current carrying lanes like components and cables. In a closed circuit, the current flow any in or out of a node lane must exist. 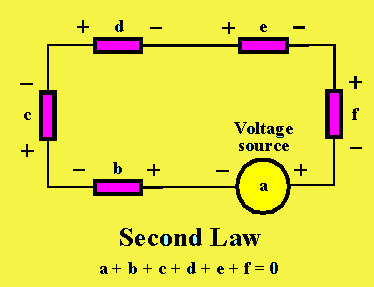 This law is used to analyze parallel circuits. KVL or Kirchhoff’s voltage law or Kirchhoffs second law states that, the algebraic sum of the voltage in a closed circuit is equal to zero or the algebraic sum of the voltage at node is equal to zero. This law deals with voltage. For instance, the above circuit is explained. A voltage source ‘a’ is connected with five passive components, namely b, c, d, e, f having voltage differences across them. Arithmetically, the voltage difference between these components add together because these components are connected in series. According to the KVL law, the voltage across the passive components in a circuit is always equal & opposite to the voltage source. Hence, the sum of the voltage differences across all the elements in a circuit is always zero. Node: A node is a connection in a circuit where multiple elements are connected together, and it is denoted with a dot. Loop: A loop in a circuit is a closed path, where no circuit element or node is met more than once. Mesh: A mesh doesn’t contain any closed path, but it is a single open loop, and it does not contain any components inside a mesh. The above circuit consist of two nodes, namely A and B, three branches and two independent loops. Apply KCL to the above circuit, then we can get the following equations. The –ve sign for ‘I’ is the direction of the flow of current initially preferred was wrong, In fact, the 20 volt battery is charging the 10 volt battery. 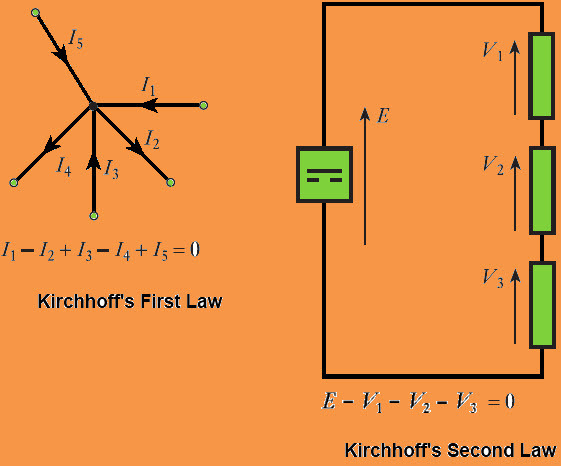 This is all about Kirchoff’s laws, which includes KVL and KCL. These laws are used to calculate the current and voltage in a linear circuit, and we can also use loop analysis to calculate the current in each loop. Furthermore, any queries regarding these laws, please give your valuable suggestions by commenting in the comment section below. I try the question and my answers are I1=0.134A,I2=-0.238A and l3=-0.095A. thanks I need more demonstration so that I will understand its.